This winter I professed my love of salted caramel hot chocolate to you. It isn't one of Starbucks current flavors, but they can still make it for you. You just have to bring your own kosher salt. Yes I have taken my own salt to Starbucks. Yes the salt does make that much of a difference. And it is even good if you have them make it over ice. They will look at you funny even before you pull out the salt, but they will make it. But I might actually get to avoid some of the crazy looks from Starbucks employees if this salted caramel ice cream from David Lebovitz is as good as it looks. And knowing David Lebovitz it will be. I don't actually KNOW him, but you know what I mean. 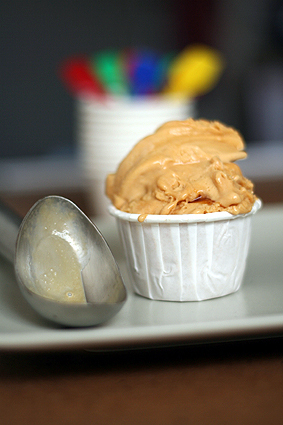 You can get the recipe for tSalted butter Caramel Ice Cream HERE. i don't dare click the link. i don't dare. oh, dang. i have to. i'm a goner. OMG! Salivating!!! Not very helpful for my diet! Sorry! It isn't helpful for a diet at all! That's such a coincidence that you post this today....just yesterday I had to google a recipe and make it because one of my kiddo wanted caramel flavored ice cream. I don't think this was the recipe I used, but it was really really good. I'm sure this one is awesome too! Oh, send me a link to yours!